One of the things that causes violin students to fight against practicing is simply the fact that playing the violin puts one into an inherently unnatural position. It is uncomfortable when you start! If the student's hand, arm, neck or shoulders ache, take a break! 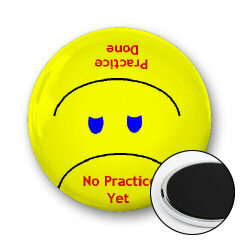 There is no magic to playing straight through a practice session. Use the resting time to listen, play bow games, ear training or rhythm matching are all viable ways to use time when a student is resting his muscles. This is a great practice reminder. 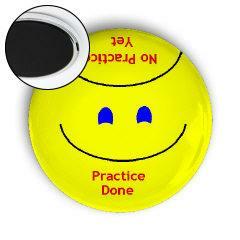 A refrigerator magnet that frowns before practice, but turns into a smile when your student turns it around after his practice and proclaims "Practice Done." Click either picture to have a look. Shoulder Rests Improve Posture and Eliminate Stress and Strain.